LINE UP: North Broadway (both the east and the west curb lanes, from Montrose to Wilson); West Montrose (both the north and south curb lanes from Broadway to Clark) and North Sheridan Road (both the east and the west curb lanes, from Montrose to Windsor). at 12:00 Noon at the Broadway/Montrose corner proceeding south on Broadway; then south on Halsted; then east on Belmont; then south on Broadway; then east on Diversey to Cannon Drive. Cross streets will close as the parade travels south down the route. Montrose Ave.-Greenview Ave. to Hazel St.
Broadway St.- Leland Ave. to Grace St.
Sheridan Rd.- Windsor Ave. to Buena Ave.
Sunnyside Ave.- Sheridan Rd. to Grace St.
Halsted St.- Grace St. to to Belmont Ave.
Belmont Ave.- Sheffield Ave. to Broadway St.
Broadway St.- Belmont Ave. to Diversey Pkwy. Addison St.- 736 W. Addison to Sheffield Ave.
Waveland Ave.- Halsted St. to Broadway St.
Grace St.- Halsted St. to Fremont St. TOWING: Due to the volume of vehicles involved, towing will begin promptly at 5:00AM. PARADE INFORMATION: The parade will feature 200 registered entries including floats, decorated vehicles, performance groups, a marching band and walking contingents. The entries represent community organizations, businesses, governmental officials and individual community members. Crowd estimates each year are in the hundreds of thousands. The parade route will be lined with barricades on both sides of the street from beginning to the end of the parade route. Spectators will be required to remain behind the barricades. (Only parade registrants traveling down the middle of the street, police officers, other city officials, parade marshals and credentialed media reps will be allowed in the street). After stepping off at 12:00 PM, the parade will take approximately two and one-half hours to finish crossing the Broadway & Montrose corner. After this time, the floats will still be winding their way to the end of the parade route at Diversey & Sheridan. Police officers along with the parade marshals will be present along the route. This year there will NOT be a Buffer Zone on Halsted Street after the parade ends. Police will work to re-open the streets to vehicular traffic as soon as cleaning crews are finished and the streets will not remain open to foot traffic. The streets on the parade route will begin to be cleaned by Streets and Sanitation immediately after the last float has passed. Streets and Sanitation will continue to clean the residential side streets through the end of Monday, June 25th. Alcohol consumption WILL NOT be tolerated under any circumstances. Open containers containing alcohol are illegal on the streets and sidewalks in Chicago. You will be subject to receiving a costly ticket and/or arrest from the Chicago Police Department. PUBLIC TRANSPORTATION: The parade route accommodates several CTA El Stations. Please look at the map below. 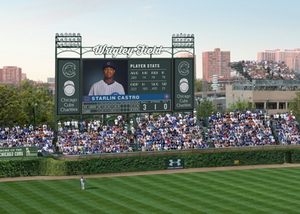 The Wilson, Sheridan and Addison stations all provide convenient access via a short walk to the parade route. From the Brown Line, the Wellington and Diversey Stations provide convenient access as well. Please note that the area around Belmont has historically been very crowded, so we urge you to consider areas near the new start of the parade route, such as Broadway Avenue south of Montrose. 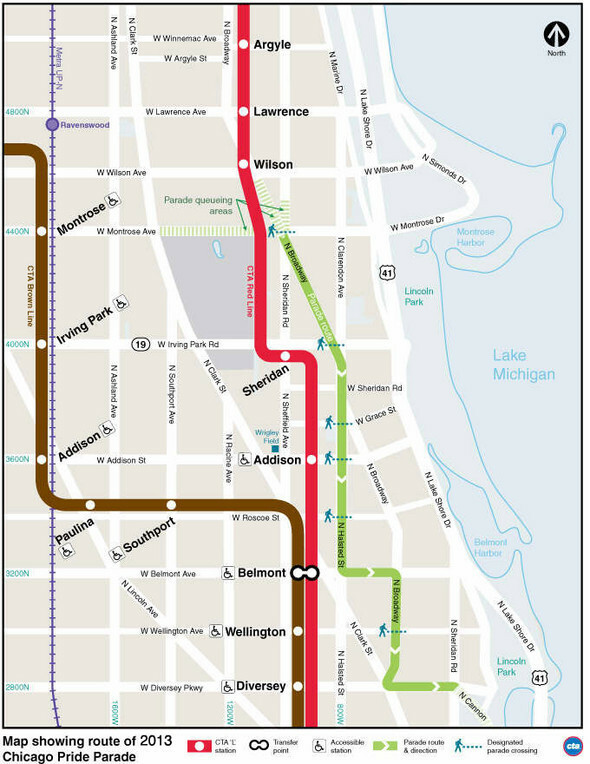 Additional information on the reroutes can be obtained by calling the CTA customer service at 1-312-836-7000 or visiting http://www.transitchicago.com/. 1. Portable Restrooms – are stationed along both the parade line-up street and the parade route – sponsored by various businesses, organizations and individuals. Included at several locations are restrooms for the physically challenged. 2. Physically Challenged Area/Wheel chair Accessible Area – for people who need or want more space: the sidewalks of West Diversey Parkway (near 600 W. Diversey). Traditionally this area of the parade route has fewer spectators than other sections of the parade route. Spectators in these areas generally arrive there early on parade morning to secure their viewing spots. Included there are restrooms for the physically challenged. For all additional information, please visit the Chicago Pride Parade website. This entry was posted in Community News, Ward 44, Ward 46 and tagged 44th ward, 46th Ward, festivals, Parking on June 27, 2013 by elvn_updates. 11th Annual Chicago Pride Fest – this weekend! During Pride Fest street closures, Broadway and Addison will be used as detour routes for vehicular traffic and the #8 Halsted CTA bus. This entry was posted in Community News and tagged festivals, Parking on June 19, 2013 by elvn_updates. PLUS Sausage King of Chicago! In addition, crowned at the event will be the “Sausage King of Chicago” (in reference to the fictional Abe Froman character in the cult movie Ferris Bueller’s Day Off). Get more information, including Main Stage Entertainment and how to sign up for a chance to be the Sausage King of Chicago! This entry was posted in Community News and tagged festivals on June 7, 2013 by elvn_updates.